Mumbai: “In the journey of institutional excellence; defining, attracting and nurturing stakeholders that involve students, faculty and long-term sustainable relationships with the alumni are of utmost significance. Focus on academics, management, strategy and a visionary perspective could add many path breaking changes in the education system”, said Mr. Ashank Desai, Founder, Mastek while delivering his inaugural address at the CII – WeSchool ‘Principal’s Conclave’. The recent call for educational institutions to be entitled to excellence has created multiple discussions about the objectivity of superior quality education. What are the key parameters in higher education that distinguish education institutions and how it could be measured are some common topics of conversations doing rounds in the academic circles. S.P. Mandali’s Prin. 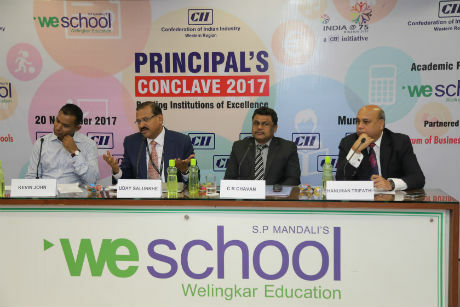 L. N. Welingkar Institute of Management Development and Research (WeSchool) in association with CII – Western Region, recently hosted ‘Principal’s Conclave’ 2017 under theme ‘Building Institutions of Excellence’ on its Mumbai campus. The conclave attended by Deans, Vice-Principals and Directors from over forty educational institutions and colleges across Mumbai took a retrospective approach to understand and highlight the areas of improvement for new age students. The second session on ‘Best Practices and Next Practices – Learn, Work and Lead’ invited experts to share new models on building world class institutions. Dr. C R Chavan, Director, Jamnalal Bajaj Institute of Management; Mr. Hanuman Tripathi seasoned entrepreneur and Kevin John, GM Strategic Alliances, Rustomjee Academy for Global Careers (RAGC) were the panelists for this session. While chairing this session, Prof. Dr. Uday Salunkhe, Group Director, WeSchool and Co-Chairman, CII- Western Region, Higher Education Sub Committee commented on imparting value education by exposing students to the market and consumers and not limiting them to the confines of the classroom. Teachers need to be learners all their life and teaching-learning is a reciprocal process. He expressed concern over the future of work in today’s changing market and believed that education has to be human and not mechanical. He wrapped up by defining education as something we remember long after we have forgotten what we memorised.